Spice Up Your Life With Herbs! 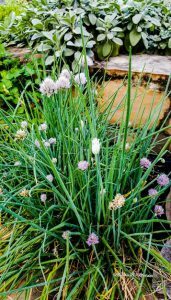 Enhancing Your Palate With Herbs! Herbs are the leaves of temperate climate plants; temperate climates have summers and winters of similar length. Examples of herbs include basil, thyme, sage, rosemary, and oregano. Today, herbs often are used in cooking to enhance the flavor of foods without the addition of extra fat, sugar, or sodium. Americans consume 3 to 4 times the amount of sodium they need in their diets. What do you use to add flavor to your food if you are consuming too much sodium? Herbs and Spices! Herbs and Spices have been used for thousands of years in cooking. During that time, it was thought that herbs and spices had properties that were beneficial to human health, but it wasn’t until recent years that scientists established just how good herbs are for one’s health. People worldwide are becoming more adventurous when cooking with fresh herbs. Why don’t you become adventurous by learning how to enhance your plate with herbs by attending Spice Up Your Life With Herbs! Enhance Your Palate With Herbs Workshop? The workshop will be conducted by UF/IFAS Extension Alachua County, Family and Consumer Science Agent, Martha Maddox. During the workshop you will discover the recommended amount of sodium you need daily, the amounts consumed and how to use different herbs and spices to reduce the sodium in your diet. Maddox will also cover the history of herbs; discuss fresh vs dried, proper way to wash herbs and store herbs. An in-depth discussion will be on the different uses for each herb and good herb combinations. Participants will learn how to make herb bundles and different herb blends plus take a bundle and some herbal blends home to use along with an herbal booklet. Workshop Information: DATE: February 28, 2018. TIME: 1:30PM to 3:30PM. LOCATION: UF/IFAS Extension Alachua County Office, 2800 NE 39 Avenue, Gainesville. The registration fee is $15.00. Please register through Eventbrite by February 23 at https://tinyurl.com/y8anppcx Questions Call: 352-955-2402. E-mail: mmaddox@ufl.edu MEMO line put herb workshop. Hi! I am Martha Maddox, the Alachua County Family and Consumer Science Agent IV. Extension, Agriculture, Family and Consumer Science (Home Economics) and 4-H has always been an important part of my life.